If you’re expecting the likes of the MET or the Vienna Philharmonic in Vegas, you’ve come to the wrong place. This city is about spectacle, celebrity, and fantasy, and its top attractions and shows embrace those themes. Whether your fantasy involves going on a mission with the Starship Enterprise or being serenaded by Elvis, you can live it out in Las Vegas with pizzazz. That said, the city does offer “high culture” for those interested in fine art or classical music and dance performance. Here are 10 of the top kitschy and high-culture attractions in Las Vegas. I leave it up to you to determine which is which. A rhinestone-studded shrine of fabulousness, the Liberace Museum celebrates the life and works of pianist and showman Walter Valentino Liberace (1919-1987). Liberace gained fame as a flamboyant performer, playing pop songs on an oversized grand piano on stages around the world. He played regularly in Vegas, and opened his own museum there in 1979. Today the museum displays pianos and classic cars from Liberace’s personal collection as well as many of the star’s elaborate costumes and jewelry, including a rhinestone-lined full-length Black Diamond mink cape and star-spangled hot pants. The museum is located at 1775 East Tropicana Avenue, a couple of blocks behind the Tropicana Casino. Admission is $12.50 per adult. With the recent addition of the Beatles-themed production Love, Cirque du Soleil now has five resident shows playing on the Strip, making it the area’s most conspicuous entertainment presence. 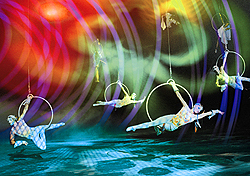 Of all the Cirques in town, however, O at Bellagio (3600 South Las Vegas Blvd. ), has been an audience favorite and the most universally acclaimed, with some likening it to a surrealist painting come to life. O is phonetic for “eau,” which is French for water, and water is literally at the center of the performance in the form a 1.5-million-gallon pool that performers fly over, swim in, float on, and dive into. Like most other Cirque productions, O doesn’t follow a chronological plotline but instead presents a collage of superhuman acrobatics, synchronized swimming and diving, live music, and engaging sketches. Tickets start at $94 per person. Ah, wax Brad Pitt—you look too good to be true. And, up close, you are—kind of like the fame and fortune mystique of Vegas itself. But Vegas is all about indulging fantasies, if only for a moment, so there’s no better place to unleash your inner celebrity stalker than Madame Tussauds Las Vegas. There are more than 100 wax celebrities on display in six theme areas, ranging from the “Sports” room, where you can offer putting tips to Tiger Woods, to the “Spirit of America” room, where you can propose your own Iraq exit strategy to George W. Bush. You can go beyond gawking at Madame Tussauds, as the attraction invites visitors to participate in “interactive” experiences such as getting married to a wax George Clooney, going one-on-one with a wax Shaquille O’Neal, and caressing “J.Lo’s most famous asset.” Madame Tussauds is located on the Strip by the Venetian at 3377 Las Vegas Boulevard South. Tickets cost $24 per adult. A collaboration between the Guggenheim Museum in New York and the State Hermitage Museum in St. Petersburg, Russia, the Guggenheim Hermitage Museum at the Venetian (3355 Las Vegas Blvd South), brings fine art from around the world to the heart of Tacky Central. Since its opening in 2001, the museum has brought in exhibitions of works by artists like Picasso, Renoir, and Cezanne, and collections of exquisite objects such as those in the The Quest for Immortality: Treasures of Ancient Egypt and Russia! The Majesty of the Tsars: Treasures from the Kremlin Museum exhibits. The current exhibition, Robert Mapplethorpe and the Classical Tradition, won’t be everyone’s cup of tea, but it certainly has the Vegas skin theme going for it. Tickets cost $20 per adult. Have you ever wished you could boldly go where no man has gone before—or at least be beamed up? Can you speak more than a few words of Klingon? Do you think William Shatner is hot? If you answered “yes” to any or all of these questions, Vegas has the perfect attraction for you. Star Trek: The Experience features two interactive Star Trek rides complete with live actors, state-of-the-art special effects, and motion simulators. In the “Klingon Encounter,” you join the Federation Crew on a mission against the Klingon warriors, and in the “Borg Invasion 4D,” you’ll be assimilated into the BORG collective. Before going into the encounters, you can tour the world’s largest collection of Star Trek props and costumes, and afterwards you can dine at the Cardassian-themed Quark’s Bar & Restaurant or go shopping in The Promenade—the biggest collection of Star Trek merchandise in the galaxy. At a whopping price of $39 per adult ($34 if you book tickets online), this may be a mission only hard-core Trekkies can handle. The Star Trek Experience is located within the Las Vegas Hilton (3000 Paradise Rd). On the First Friday of every month, more than 70 art galleries, artists’ studios, antique shops, and other venues stage a massive art gala downtown that’s open to the public. But this is no hoity-toity wine-and-cheese affair (although you can get that too), it’s more of huge block party. Art spaces such as the Arts Factory, the Funk House, and Dust host late-night receptions and individual artists display their creations on the street. Bands and DJs play at various locations in the area and performers ranging from fire-breathers to break-dancers entertain spectators on the streets. Attending the event is free, but if you buy a Friends of First Friday button for $10, you’ll be entitled to discounts and other perks at select businesses. Most of the action takes place downtown near the corner of Colorado Avenue and Casino Center Boulevard and on Charleston Boulevard, Main Street, and Commerce Street. Glowing multi-colored neon lights are synonymous with Las Vegas, so it’s fitting that the city has an institution dedicated to neon signage. The museum has signs from defunct or renovated Las Vegas hotels, casinos, and restaurants dating back to the 40s, with 10 restored signs currently on display along Fremont Street in downtown Las Vegas. You can view neon masterpieces such as the Hacienda Horse and Rider from the Hacienda Hotel and Aladdin’s Lamp from the original Aladdin Hotel. Walking up and down Fremont Street is an experience in itself, thanks to free nightly Viva Vision light and sound shows which are viewed on a 90-foot-tall, four-block-long canopy screen that covers the street. If you still can’t get enough glitter, you can see a collection of unrestored neon signs at the Neon Boneyard. This three-acre site near downtown can be toured by appointment only for a minimum donation of $50. It’s amazing that a city the size of Las Vegas has no major civic performing arts center (although a plan for one is finally in the works). Luckily for those who can’t bear to visit a city without going to the opera or the ballet, the Performing Arts Center at the University of Nevada, Las Vegas, shelters the Las Vegas Philharmonic, the Nevada Ballet Theatre, and the Nevada Conservatory Theatre, in addition to UNLV’s symphony orchestra, wind orchestra, jazz ensembles, and dance department. Between all the various organizations, there’s almost always something going on in one of the center’s three venues. Upcoming highlights this winter and spring include the Moscow Festival Ballet performing Swan Lake, the virtuoso guitarists Sergio and Odair Assad, and the Blind Boys of Alabama. Ticket prices vary. The arts center is located on Maryland Parkway, just a couple of miles from the Strip. While one-time superstar singers like Britney Spears and Michael Jackson have gone a bit loony, you can still see them—or at least their highly talented impersonators—perform in the flesh in heyday form at American Superstars. This production show features acts by skilled tribute artists (and fairly decent look-alikes) singing a mix of recent hits by stars still in their prime such as Christina Aguilera to Vegas classics from the likes of Elvis. The show has been hosted at the Stratosphere (on the Strip, 2000 Las Vegas Boulevard South) for more than 10 years and was recently named the “Best entertainment value in all of Las Vegas” by the Las Vegas Advisor. Tickets start at $42 for the show alone, or $50 for the show, a dinner buffet, two drinks, and admission to the Stratosphere tower. There is not just one, but two exhibition spaces devoted to fine art on the Strip. A couple of years younger than the Guggenheim Hermitage Museum, the Bellagio Gallery of Fine Art hosts similar collections. Past exhibitions have displayed works like Andy Warhol’s celebrity portraits and Monet paintings from the Museum of Fine Arts, Boston. Currently, the gallery is running a show of Ansel Adams prints. The gallery is inside Bellagio (3600 South Las Vegas Blvd.). Admission is $15 per adult.